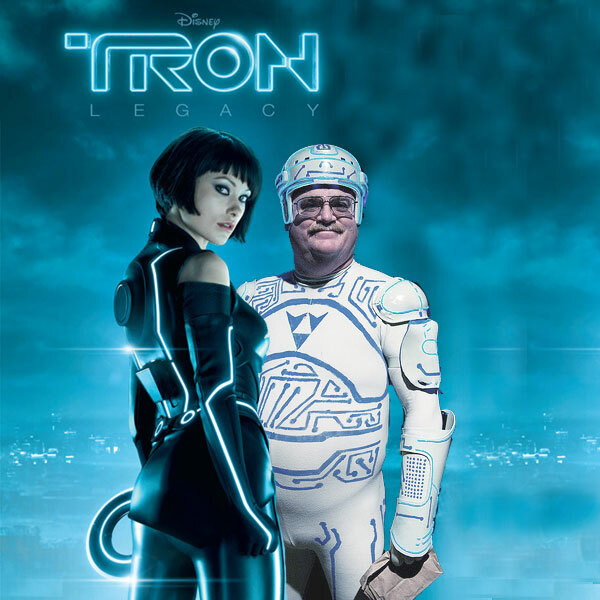 Jay Maynard, aka TRON Guy, was kind enough to do an interview in honor of this weekend's #1 film, TRON: Legacy. He's seen the film again since his Wired review, and I asked him about his favorite surprises that were a nod to the original (hearing Journey's "Separate Ways" at high volume). He also liked a lot of the repurposed lines, but he didn't want to drop any spoilers. He wanted to see MOAR of the fastest thing on the grid: Sam with Flynn's lightcycle. Outside of his TRON fame, Jay is project manager on the open source Hercules project, so we talked a bit about the film's take on open source and cracking, etc. Jay also has some excellent advice for makers and cosplayers alike after the break. How many personal appearances have you originally made since your original suit? A few dozen, mostly right after it was first sprung on an unsuspecting world, muah ha ha ha. I make a few a year now. What has been the highlight of your experiences since putting up your site and photos? Appearing regularly on Jimmy Kimmel Live! was definitely the highlight. I had a lot of fun doing that show, and they went out of their way to make me feel like I was special and yet part of the family. If they asked me back, I'd go in a heartbeat. Any plans to make a new suit based on the sequel? Very definitely. I've got a pretty good idea of how I'd approach it. The main things I need now are time and money; the rest I can acquire. Do you play video games, and if so, do you plan to check out the TRON: Evolution game? As you may know, it covers the time period between the original and the sequel. I'm not a gamer, but I am planning to get TRON: Evolution. I also expect it to mop the floor with me. The big question for me is which version to get, especially since I'm a Mac person who refuses to run Windows and don't own any of the consoles it runs on. What is your opinion on how hackers and open source are presented in the new film? I truly believe in open source. I'm rather ambivalent about the portrayal of open source in the film. As Sam Flynn's cause celebre, it provides his motivation for being involved with Encom at all; at the same time, it takes a very Stallmanite view of open source that, I think, does the whole arena a disservice. Not everyone in the world of open source agrees with Richard Stallman's utopia. Do you have any tips for making a suit like yours last longer, or any design changes you would make now? My costume is getting close to 7 years old, and it shows it. If I had it to do over again, I'd definitely stiffen the armor where the electroluminescent wire currently flexes, because I've had to splice it a few times, and that stuff is a royal pain to work with. I'd also have silk-screened the unitard so I could do several at once - right now, all I have is the one, and it's wearing badly in spots (mostly invisible). What is your advice for someone who wants to make something and has never done it before? Be sure you understand what you're about to do, and wade in. Don't be afraid of making mistakes. If you make a mistake, you're learning things. My hands are full of 40-year-old soldering iron burn scars and such, but I wouldn't trade away a single one of them. Beyond that, measure twice and cut once, and remember that you have it easier than older electronics geeks did: it's a lot easier to change bits in flash than diodes on a circuit board. One other thing: Ignore the naysayers. If you're enjoying yourself, that's what really counts.